So you’re reading an article online and you’d like a little background on something mentioned in the text. If you’re like most people, your first instinct is to pop open a new tab and google the phrase. But if you have the Apture plugin installed in your browser, you can simply highlight the phrase and let Apture do the searching for you without even leaving the current tab. Apture is a plugin for Chrome, Firefox, and Safari. It doesn’t take any maintenance or attention. Instead, it just activates whenever you highlight a phrase in your browser. 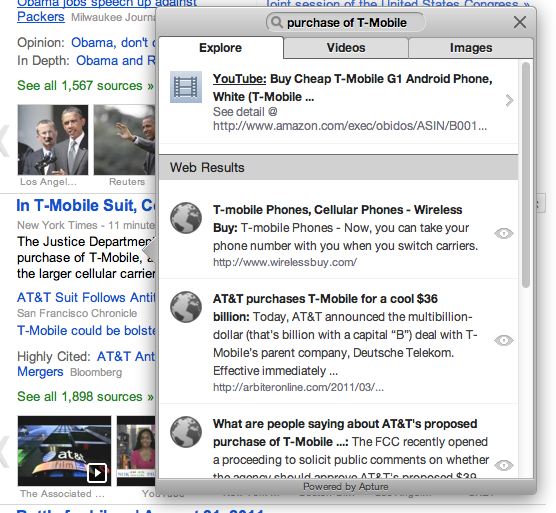 When you highlight a phrase, Apture pops up a little Learn More menu and automatically starts searching for the highlighted phrase on Wikipedia, YouTube, Google Images, Twitter, and other sites in the background. If you click the Learn More button, Apture will pop open a box of results for you within your current tab. If you don’t click the Learn More button, you can still manipulate highlighted text just as you normally would. Right-clicking the highlighted text will still give you an ordinary context menu, and hotkeys will still let you cut and paste highlighted content. Apture is a handy way to get quick info about something that catches your interest online without disrupting what you’re currently doing, and without forcing you to open up a whole bunch of tabs.